Ais Mc: Christmas Wishlist | Beauty. When Christmas rolls around it always sends me lusting after various items, none more so than high end beauty that I can never justify treating myself to. So, just for fun (and to give some people ideas..) I thought I'd compile a little list of my most sought after products. 1. How long have I been wanting something from Hourglass? Well over a year I'd say, but I've never managed to get my hands on any. I'm still desperate for some Ambient Lighting Blush, particularly in the shade Mood Exposure, it offers the perfect deeper shades that I love for Winter time. 2. I got NARS Sheer Glow in the shade Mont Blanc last year for Christmas and it changed my foundation life. Perfect buildable coverage with shade that actually matches my skin, what more could a girl want? 3 & 4. Ever since I fell in love with a more neutral lip I've been eyeing up MAC Stone lipstick and Stripdown lip liner. They're a little bit deeper than your regular neutral shade, but allow me my fix of dark lips when I need it. 5. I love eyebrows, but I've been using the same brow shade for well over a year now. Although I still love my Eyebrow Cake from Illamasqua, every blogger possible has been raving about Anastasia products, and I'm dying to try the Dipbrow Pomade in the shade Taupe. 6. Pixi seem to be everywhere at the minute, and I still haven't got round to trying the product that brought them to my attention - the Pixi Glow Tonic! I need it. 7. I've never tried any of Sunday Riley's products but I've always wanted too. Cleansing balms are my favourite way to remove make-up and impurities from my face, and the Blue Moon Tranquility balm seems perfect. Plus every blogger and her dog is raving about it. 8. I love a loose powder, it gives a matte complexion without that dry, cakey look. The Ben Nye Neutral Set powder helps to control oil on the face and the translucent shade means it won't alter my makeup shade. Win! 9. When I got this face mask as a sample at a blogger meet up I fell in love instantly. The Glam Glow Power Mud cleanses and purifies the skin without drying it out, I love it. It is quite pricey but because I've used it before, I know it's worth it. 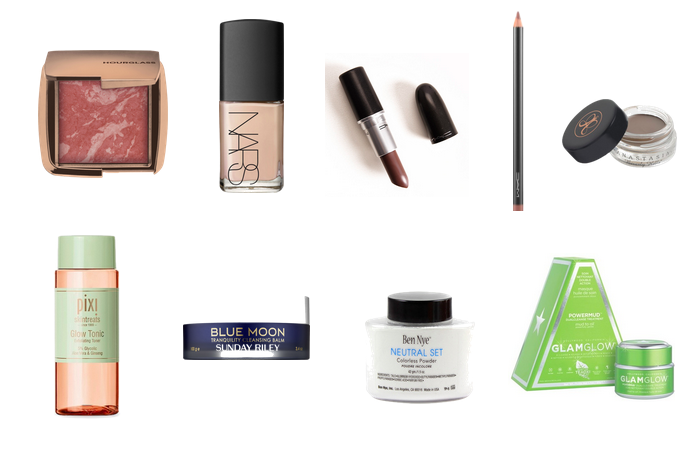 Some lovely picks, I need to get my hands on some Nars Sheer Glow (but until my current foundation runs out I can't quite justify it), almost every blogger/vlogger I read/watch has it and it looks amazing! Also love the colour of that Mac lipstick, the darker shades are my favourite at this time of year!! great picks! i have been wanting something from hourglass for forever! definitely need to get my hands on something from them very soon! Tarte | Lights, Camera, Flashes.